The Fujica X mount lenses was a design of lens mount designed by the Fuji Photo Film Co. for use on their single-lens reflex camera designs. The X mount used a bayonet mount which flange focal distance was 43.5 mm. Introduced in 1980 X mount was Fuji's move from screw mount to bayonet type mount. 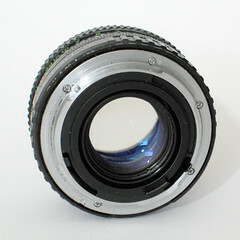 X mount lenses were discontinued in 1985. Fuji's lenses that utilized X mount were named X-Fujinon. Shown on the left is the Fujica-X bayonet mount. It has an aperture coupling lever that communicates it to the body and thus allows open aperture metering. Fuji produced lenses from 16 to 400mm for their X-mount. Although only in production for five years, there were even x-mount lenses being produced by third-party manufacturers, such as Sigma.